I’ve always thought of applesauce as a rather plain food. When my mom assembled my lunch for school, she’d often include individual packs of cinnamon applesauce. I always liked it, but there was never anything particularly special about it. You can’t imagine the excitement I had when they started coming out with all of the wacky colors and flavors. Blue, red, green, or orange applesauce packs were unveiled in my lunch bag every weekday afternoon. They came in many flavors like blue raspberry, strawberry, and peach. That they were “flavored” is the key concept here. Although some brands did add fruit puree, they also added high fructose corn syrup, “natural” flavorings, and artificial colors. I think we can do without all of that! Back then, I was entranced by the fun colors and flavors, but now I’m not so easily hooked in by imitation gimmicks. I still like fun colors and flavors, but I want the real thing. Enter my abundance of fresh cranberries and a fine recipe idea. Since I just can’t say no to those plump, Christmas-red cranberries at the store, I decided to use them to dress up some raw applesauce. This sassy applesauce (applesass?) is sure to wow you all. 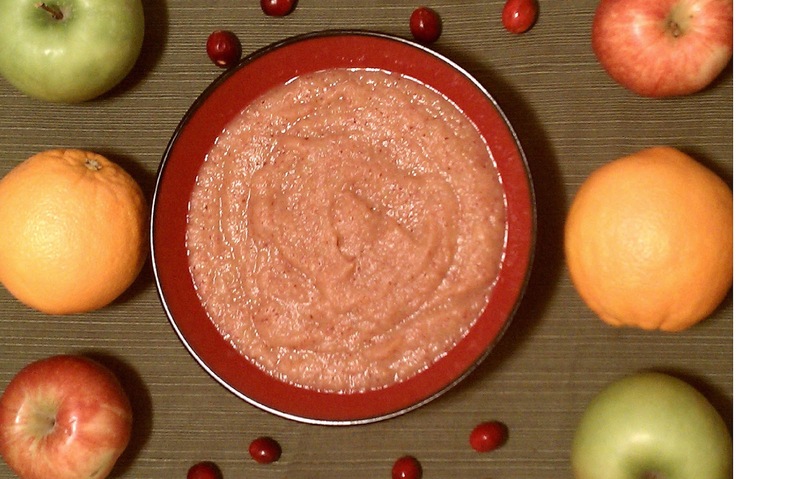 There is nothing “imitation” about this cranberry applesauce. It’s a pleasantly tart treat with a tease of sweet. If winter ever decides to come around (I miss you, snow! ), the ginger will warm the chills right out of your body. And, if I may offer one suggestion: Don’t tuck it away in a lunch pail because it’s all decked out for a prime spot at the dinner table! 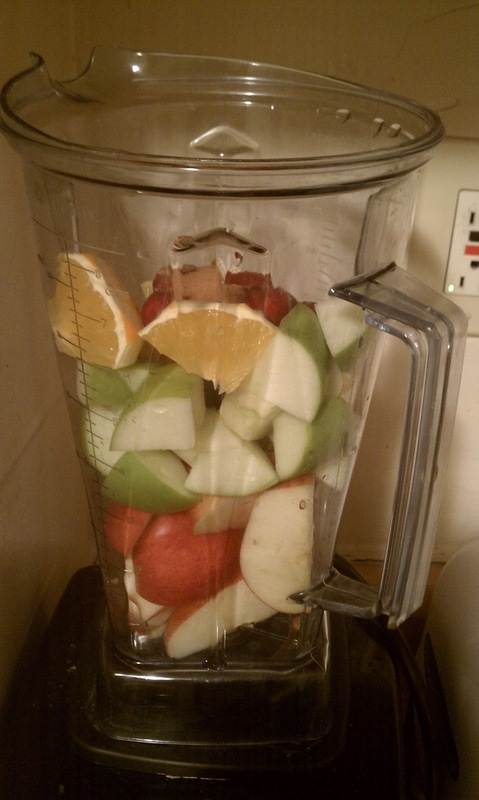 -Add all ingredients into a blender. Blend and serve.